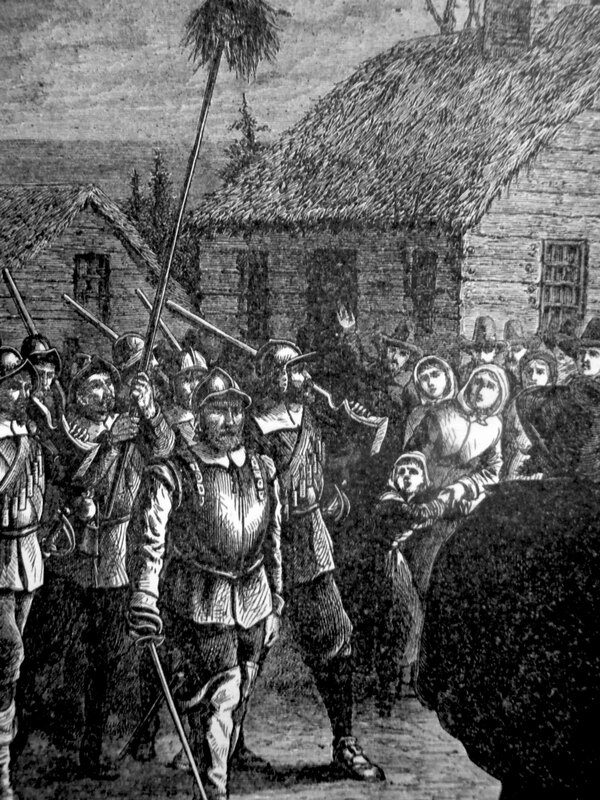 In July of 1620, a ship named the Mayflower embarked from England with 102 English Puritan Separatists who were collectively called Pilgrims. Under harsh conditions, the 100 foot long ship would more take almost three months to sail to the New World. They would land on December 22, and the severe winter would soon claim 50 lives. Chief or Sachem Massasoit of the Wampanog tribe, would make first contact with the new Plymouth Colony one hundred and one days later. He is largely credited with saving the remaining settlers. Not only would he feed the first immigrants, but he would live side by side with them as his friends for many decades. Massasoit had two sons. His friend, then Governor Winslow, would name them Alexander and Philip. After Chief Massasoit died, Alexander became the chief. However, he would also die suddenly and Philip would become chief. After a while the local settlers began calling him King Philip, but his tribe knew him by the name Metacomet. At first King Philip was as friendly with the Puritans as his father. However, as time passed he and his tribe lost more and more of their native hunting grounds to the new settlers. Unfortunately for them, new settlements were now springing up everywhere. At the time there were already 80,000 white Europeans living in the area we now call Massachusetts. It didn't take long before things got crazy. A teacher, who was one of the members of the Wampanoag tribe accused Philip of plotting against the Jamestown colony. As a direct result, he was killed by members of the Wamanoag tribe. The Puritans responded by arresting three tribal members. Subsequently, they were given a quick trial and hung. King Philip's didn't have to encourage the other tribes to attack. They had all had enough of the white Europeans. From the very beginning Philip knew that the odds were against them. The English had guns, forts, and almost unlimited supplies. On the other hand, Philips warriors were only armed with old muskets and bows and arrows. The war exploded across New England. The Indians, took on the strategy of avoiding the troops, and never meeting them face to face in the open field . In little over a year, over 50% of the towns were attacked, and 12 towns were burned to the ground. The loses were staggering. Both women and children were murdered and their homes were burned to the ground. In addition, 1 in 10 men who were military age were killed. The New England economy was in ruins. Chief Canochet and his Narragansetts tribe had long maintained a fort. The colonists knew it as a hiding-place for the Indians who had been defeated. In December 1675, Josiah Winslow and 1,000 well armed men attacked the fort and burned it, killing everyone. They also destroyed their food supply. Chief Canonchet was taken prisoner, where he was told that he would be set free if he would make peace. He declined, and was promptly hung. At the time, a disillusioned and saddened King Philip lived as a fugitive traveling from tribe to tribe. Before long, his wife and children were captured. Then, just as the Jamestown colonists started closing in on his capture, he was ambushed by one of his own. The colonists marched back to Plymouth with his decapitated head flying from the top of a pole.